Dogasu's Backpack | Manga Guide | Aim to be a Card Master!! Minamii Kenta is a young Japanese boy who enjoys playing the Pokemon Trading Card Game. He becomes bored playing with only his friends, so, at the advice of his friend Natsumi, he visits the Pokemon Center in Tokyo. While there, he meets the young boy who would give him a defeat so humiliating that he decides to train until he's good enough to become a champion. 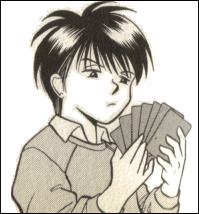 As Kenta wins match after match, he becomes closer to becoming a Card Master. Kenta first appears in Chapter One. Okabe Shou is Kenta's rival. The young boy is famous for being a fierce player, making Kenta's desire to beat him that much stronger. While Shou can be cocky at times, he also displays a sense of excitement at the prospect of a player who can challenge him. 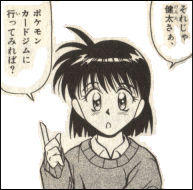 Shou first appears in Chapter One. Natsuki is the young girl who advises Kenta to play against players in the Card Gym at the Pokemon Center in Tokyo. She often acts as a cheerleader to our hero and makes sure he stays focused on his goal. Natsuki first appears in Chapter One. The employee at the Pokemon Card Gym (and later, the District Convention) is the one who informs Kenta of Shou and the District competition. She also teaches Kenta how to make the most of his cards and assists him in building a well-balanced deck. The Card Gym Employee first appears in Chapter One.